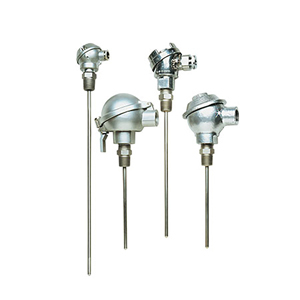 The industrial Thermocouple style assemblies offer a variety of protection heads to meet the environmental and size requirements of most applications. Available in type J, K, T or E calibrations, with either 304SS or Inconel sheathing (321SS provided on request). Standard lengths are 12" including 1/2" for the pipe thread, industrial thermocouple probes with other lengths quickly available. Both the thread on the probe and the extension wire opening are 1/2" NPT. The NB2 and NB4 include a compression fitting nut and rubber ferrule for 1/8" to 1/4" O.D. wires or tubing. The internal terminal block is standard on all models. Consult Technical Quotation Dept. for price and delivery on PFA-coated assemblies or a wide variety of non-metallic and other specialized heads. All industrial head probe styles are available in Super OMEGACLAD XL probe sheath. Note: Other lengths available, consult Sales Department. To order 321 stainless steel sheath, change “SS” in model number to “321SS” and call Sales Dept. No additional charge.